In this solo cooking adventure, Gary attempts to salvage some rice he added way too much water to. Top left – leftover rice and water in the pot. Top right – rice after absorbing most of the water. Bottom left – marinated pork is added to the pot. Bottom right – chunks thousand-year-old egg added to the pot. So what does one do with rice made with too much water? In a recent attempt to make fried rice, I had used too much water to make my rice (Kate thinks her sloppiness has worn off on me; hey, if she wants to let me off the hook, then sure it has!) and I ended up with a messy, inedible fried rice. Depressed, I dumped my half-eaten plate of fried rice and contemplated what to do with the remaining four cups of rice sitting in my refrigerator. Suddenly, it came to me – congee! Congee is a rice porridge that’s often made with leftover rice (so is fried rice but, as I said before, I screwed that one up). While growing up, congee tended to be something my mother would make for me whenever I was sick. It’s basically rice and some other stuff thrown in so it tends to be a nice, clean meal to have – perfect when your stomach is bothering you after a few rounds with a stomach flu. When made in the winter, it’s a simple meal to put together that will keep your belly warm before heading out into the cold. Top left – leftover rice. Top right – marinated pork. Bottom left – chunks of thousand-year-old egg. 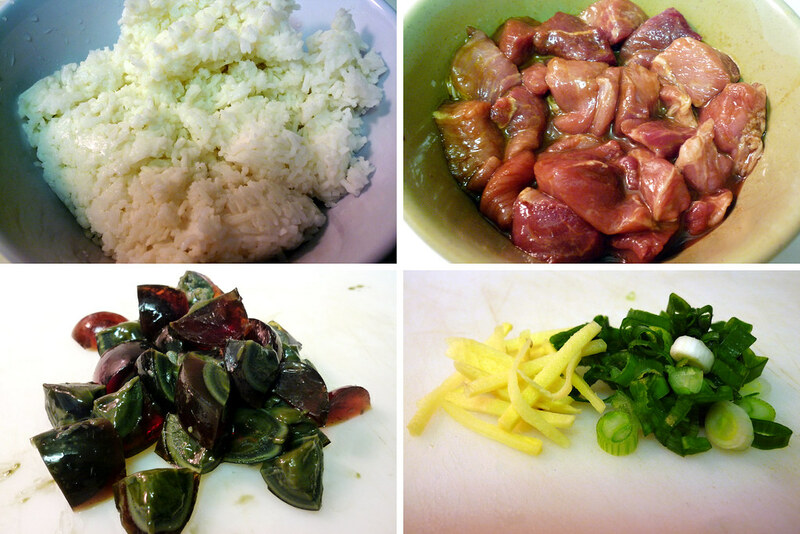 Bottom right – sliced ginger and chopped scallions. Oh, and it’s quick. Really quick. If you’re starting with leftover rice, it’ll take 45 minutes for it all to come together. Even if you start with uncooked rice, it’ll be done in just a little over an hour. Added to my leftover rice was plenty of water, some marinated pork, and thousand-year-old egg (it sounds stranger/worse than it really is). If thousand-year-old egg doesn’t sound like it’s up your alley, try some sliced hard-boiled salted duck eggs or even regular ol’ chicken eggs. If you’re vegetarian, no problem, maybe add some baby bok choy. Near the end, I like to add a little chicken bullion to add some flavor. Again, if you’re vegetarian, some sesame oil here wouldn’t hurt. Bowl of congee with the ginger, scallions, and white pepper added for flavor. 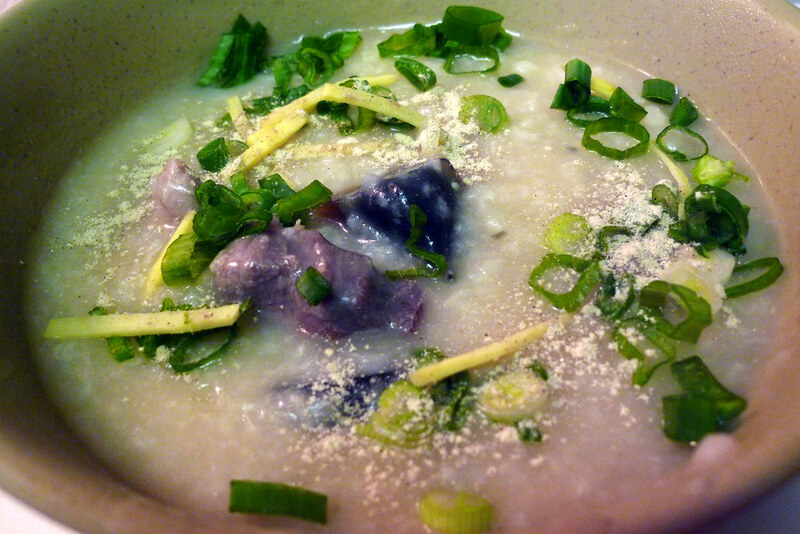 To serve, ladle the congee into a bowl and add some sliced ginger, chopped scallions, and a few dashes of white pepper. Mix it all in and you’re ready to eat. Also, if you’re fortunate enough to live near a Chinatown, you should consider getting some you tiao to complement your congee. Marinate the pork with enough of the dark soy sauce, rice wine, salt, sugar, and corn starch to coat every piece of pork. Allow to marinate for at least 30 minutes (a few hours would be better). In a large pot, add the rice and enough of the water (it should take about 5-6 of the original 8 cups). Keep the remaining water on hand to add to the pot as the water is absorbed into the rice to prevent burning. Bring to a boil and let simmer for 20 minutes. Stir often. Again, add water as necessary to keep from burning. Add the pork and let it simmer for 5 minutes before adding the chopped thousand-year-old eggs. Let this simmer for another 10-15 minutes. At this point, the congee is just about done. 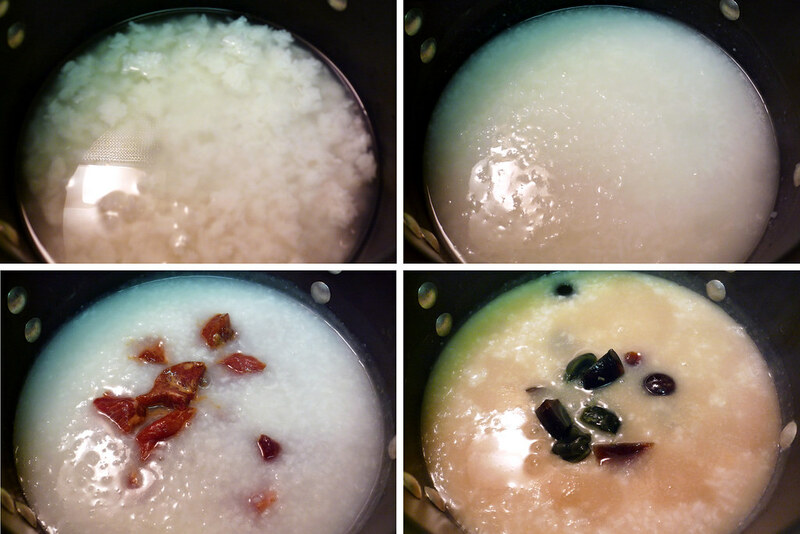 If the congee is too thick for your liking, add more water until it reaches your desired consistency. Also, now would be the time to stir in either the chicken bullion or sesame oil. Salt to taste. Serve in a bowl with sliced ginger and chopped scallions. Add a few dashes of white pepper if you want a little kick to your congee. Gary — Nice save! It seems the simply components are the easiest to screw-up. With rice the trick is to use less liquid than instructed on the package and never, NEVER lift the lid. Thoughtful of you to add substitutions for the vegetarians out there ( eh, Hello Kate)It’s interesting how different cultures find solace in similar foods — congee….rice pudding (made some for Karen yesterday)….risotto. Good work Gary. An appreciative nod for adding a facebook “fan” page.